Happy Labor Day! I hope you all have been enjoying the holiday weekend and your extra time off today. If you follow on SnapChat you’ll know my weekend has been incredibly lazy, and it’s exactly what I wanted it to look like. With that said, I did carve out some time to scout the best Labor Day Weekend sales going on so you guys don’t miss out! EQUIPMENT – take up to 60% off select items like this elegant black silk shirt (love the tassel tie detail! ), this luxe pair of pajamas (that print is to die for! ), or this button-detail cashmere sweater (on sale for under $120!!). HORCHOW – enjoy 20% off sitewide (qualifying items are designated on the site!) and free shipping (excludes furniture**) when you spend over $150. Stock up early on holiday decor, snag those sconces you’ve been eyeing or add a glam touch to any space with this mirror. Even my coffee table is part of the sale!! Enter code LABORDAY at checkout! INTERMIX – save up to 80% during the Labor Day Event when you get an extra 40% off all markdowns! If you’ve got a beach trip still looming, check out this beautiful Caroline Constas print. It’s also a great option if you live somewhere warm to wear into fall – gorgeous darker colors! This LoveShackFancy dress is another great transitional option for warmer climates like Florida and California. This A.L.C. t-shirt dress is such a chic travel staple.. it also comes in this black tank style. Also, don’t miss this INTERMIX-exclusive denim – obsessed! My personal favorite? This golden floral blouse by Australian label, LOVER. KATE SPADE – enjoy an additional 30% off all sale styles through tomorrow night! This sleeveless ric-rac black knit dress would be such a great option for work or dinner this fall. Throw a leather jacket on top when the temps start to drop! If you obsess over stripes, do NOT miss this top – it’s got the most fun tassel detail and is now on sale for under $80! The contrast piping on this white ruffle blouse is exquisite – another fab find for the office! Also loving these criss-cross heels and this bag. Enter code GOLDEN at checkout. LOFT – get a whopping 40% off full-price styles through tomorrow night! Don’t miss this luxe-look faux leather jacket, this long-sleeve fall floral dress, and this cozy open cardigan in three great fall neutrals. LULU & GEORGIA – the more you spend, the more you’ll save during this one! Get 10% off when you spend $300+ (code: GOOD), 15% off when you spend $550+ (code: BETTER), 20% off when you spend $800+ (code: BEST), and 25% off when you spend $1,500+ (code: BANANAS). Take a peek at this rug, this bench and this accent table. NEIMAN MARCUS – enjoy up to 65% off regular prices during the End of Summer Sale! My faves? This dress my mom just picked up – I tried it on over on SnapChat yesterday… SO CUTE! Also, don’t miss this pair of Stuart Weitzman boots, this made-for-a-fall-wedding cocktail dress, and this Trina Turk one-piece I wore yesterday to the pool. 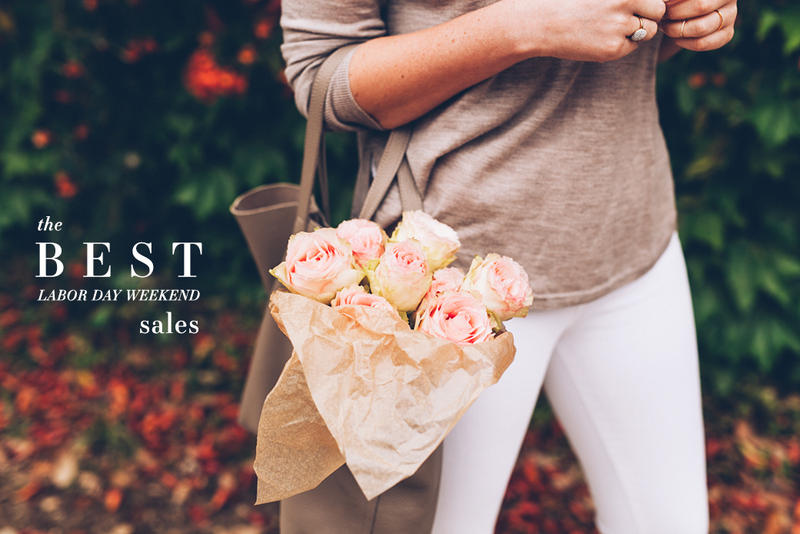 POTTERY BARN – buy more, save more during Pottery Barn’s LDW sale! Spend $100+ and you’ll save 15%, spend $500+ and you’ll save 20%, spend $1,000+ and you’ll save 25%, and spend $3,000+ and save 30%. Exclusions apply – enter code SAVEMORE at checkout! TUCKERNUCK – take an additional 25% off all sale styles today only! Take a peek at this black eyelet blouse and this pretty green peplum top before you checkout! Enter code FINALSALE25 at checkout. VINCE – enjoy an extra 25% off sale styles until midnight tonight with code LDAY25 at checkout! Snag luxe basics like this easy swing tee, this suede moto jacket, and this slit-back cashmere sweater. Loving all these sales! So many great deals!